Python was released in 1991 by Dutch programmer, and fan of Monty Python’s Flying Circus, Guido van Rossum. The goal of the language was to “combine remarkable power with very clear syntax”. In the words of the people behind Python, it is “an interpreted, object-oriented, high-level programming language with dynamic semantics.” It’s regarded as a language that is easy to learn and relatively inexpensive to maintain. This language allows functions to be carried out using simple commands and significantly fewer lines of code than other languages. The fact that it’s a more straightforward language to write means that developers who use it can spend more time contemplating what they plan to solve rather than the complexities of the language that will be used to create a programme. Python is an open source programming language that is an excellent choice for beginners. However, while this language may once have been described as a “gap-filler” that “automates the boring stuff”, it has grown massively in popularity and is an essential ingredient in current and future technologies in web development, automation, data analysis, machine learning, artificial intelligence, network programming, virtual and augmented reality, and scientific computing. As already mentioned, Python now plays a big part in many current and future technologies. With it being a general-purpose language, it can be used to build pretty much anything, and because there is easy access to many libraries, it means that it can be used for so much more. It is a genuinely versatile language. Image from XKCD under creative commons. 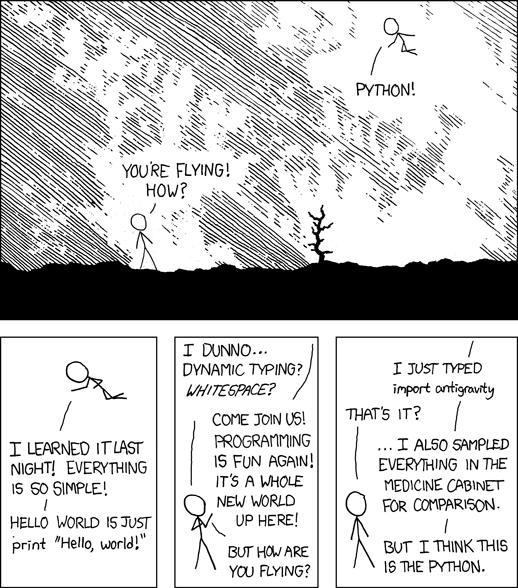 In today’s technology, Python is described by many as being the most efficient language for automation. Likewise, it is widely thought that it is the best programming language for Artificial Intelligence (AI) because of its syntaxes being simple and quickly learnt. When it comes to machine learning, the ideas exchange platform, “Towards Data Science”, tells us that 57% of data scientists and machine learning developers utilise it, with 33% prioritising it for development. As a result of the popularity of social media and apps on smartphones, big data has grown massively. Right now in the business world, data is power. If companies want to survive, it’s vital that they collect and understand the data that is made available to them from customers. Many of the most popular data mining tools are written in Python. As a result, it is an excellent tool for data science. Python’s tools allow developers to separate important and relevant data. Not only is big data useful for retaining customers, but it can also be deciphered in a way that helps organisations learn more about themselves. This type of information can show businesses where their weaknesses are and allow them to react once identified. As technology advances, the boundaries of possibility as to what can be achieved constantly move. I mean, who thought thirty years ago that 3D printing would be an actual thing? Who believed twenty years ago that we would be able to monitor everything from our heartbeat to our step count through our mobile phones? Here’s the thing, technology is only advancing. More things are becoming automated and artificial intelligence and machine learning are no longer things that we hear about in sci-fi movies. The future is now, and right now, Python is a hot language for most of the buzzwords of technology. Why should you learn it? If you’re contemplating a career in software development, then Python is a language that is growing in popularity among business. Why? Because business is automating more and more, data is making money, and machine learning is a reality of the future. Right now, there are hundreds of thousands of unfilled software developer jobs around the world. Knowledge of Python is a great way to get your foot in the door of an ever-expanding industry. About Code Institute – Don’t forget to subscribe! Code Institute’s Full Stack Software Development programme teaches Python as a back-end language. The reason for this is because it’s a fantastic language for people who want to change career. It’s easier to learn than other languages, and it’s in very high demand. Our course is designed with regular input from our Industry Advisory Council (IAC). Our IAC includes global companies such as Salesforce, GSK, Accenture, Capgemini and more. They advise us as to what industry needs and as a result, our students graduate career-focused and industry-ready. If you have no coding experience, why not try our free 5 Day Coding Challenge? While it does not go into Python, it will show you some of the basics of HTML and CSS. At the very least show you if you have an aptitude for coding.